The little town of Sassafras in the Dandenong hills outside Melbourne is a popular place to visit. At weekends you have to stand in line to get a table at one of the eateries in the tree-shaded street. In addition to the motorcar visitors hoping to get a few degrees cooler in the hot Victoria summer, coaches disgorge footsoldiers of tourism on the hunt for curiosities, antiques and ’collectibles’ in Sassafras and its neighbouring Dandenong townships. There is, for instance, the ’Oracle’ shop at the top of the town. Packed, literally to the rafters, with all sorts of icons of witchery and alternative religion stuff. Buddhas, goblins, Russian 'theotokos' woodpaintings of the Virgin Mary, angels even. You can have tarot readings there too. But it is beautifully done. This was my third time there in six years and it hadn’t changed a whit. No more than some beliefs never do. There is also, beside the quaint ’Miss Marple’s Tea Rooms’ maybe transplanted out of the Cotswolds back in England, a ’tea shop’. With the biggest selection of teas I have ever seen. And probably also the largest variety of tea pots and tea-making accessories. There’s a gift shop, a candles stop, and a maze of backyards turned into an emporium of antique and oddities. Also a lovely place of inexpensive but classy artisan jewellery and clothing accessories. But this visit, my best bit was the Rover 3500 (just like the one above) that I spotted through the open door of an old garage beside a pair of petrol pumps that were of similar vintage to the car. We’re talking early 1970s. It is the only place you can get petrol in Sassafras. There’s a sign on the pumps about opening hours, and ’sorry, we don’t take cards’. I think he was older than me. 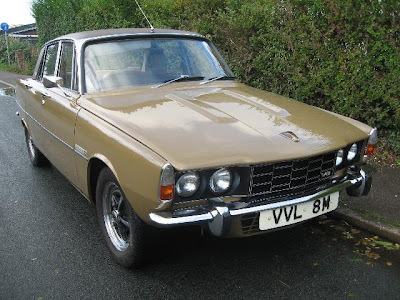 Though that’s hard to tell these days, because I still feel the same age as I was when I did own that P6 generation Rover, in Ireland in the mid-70s. And I was then heading for my mid-30s. He must have seen commonality. He walked with me into his garage. The Rover was a fawn colour which I remember from its time. It was in really good nick on the outside. A bit scrappy inside, mostly because it was being used as a regular car and had gone seriously 'round the clock' by now. “The wings used to rust here, and here,” I said, tracing my finger along the the offending areas. My first 2000 TC had suffered the affliction, but I had spent preservative money on the subsequent 2200 TC to make sure it wasn’t going to happen with that one. We traded lore. Rovers for Australia at the time were built in New Zealand from completely knocked down or CKD kits. As was the case in Ireland’s car assembly industry for many models, including the VW Beetle of the 1950s onwards, the first VW assembly plant outside Germany. “Look at the glass, it says ’New Zealand’ on the corners,” he showed me. A proportion of local components helped to avoid import taxes. We did it in Ireland before we joined the EEC and had to eventually give up providing tax protection to local assembly. Those Rovers were good. In many ways ahead of their time. Aluminium doors and boots and bonnets. Pity the wings weren’t aluminium too. It doesn't rust. We talked engines. The 3.5 V8 was also aluminium. An innovative ’small’ Buick motor which Rover bought from GM when the American company didn’t want it anymore. It subseqently grew to 3.9 and eventually 4.4 litres. Did sterling service in Rovers, Land Rovers and Jaguars. Finally replaced by a modern Ford V8 block after the blue oval bought the Land Rover brand from BMW. We got to the successor SD1 with fluid supercar styling, inheriting the great powertrains. It died because British Leyland workers couldn’t be bothered to do their job properly. In fact, they had already begun the destruction of the P6 before the SD1 ever got a chance to shine. And the fact that they had forgotten the most important thing any of us can lose. Pride in what we do. I didn’t have to go to Sassafras to find that out. But I’d go back and talk to that man again, anytime, because he has enough pride to keep a 38-year-old classic going every day. Even if he doesn’t get to park it for free in Melbourne any more. And because he runs his petrol pumps on his very own terms too, like I did in the '73 fuel crisis. You can't help but say, 'go, man'.